Clocking in late hours to keep ahead in the game, every Friday looms with the promise of respite, closing the door on the week that was, and opening another to the weekend ahead. With just 48 hours to spare, make the best of what you've got. Start crossing out your go-to list without further ado by choosing from our pick of four global getaways that meet the 'hop across' criteria. Just a quick plane ride away, these international hotspots are easily accessible and well connected. Book yourself a two-way flight for 48 hours of uninterrupted 'you' time. After all, there's never a bad time to pack up and leave; even if it's just for the weekend. It's close enough to hop across for a weekend, yet further enough from the frenzied life in Indian metros. Dubai is an attention grabber that can give global hotspots a run for their money; quite literally. Sparkly, unabashedly materialistic and grossly indulgent, the city makes no apologies for its hedonistic lifestyle, offering an open invitation to anyone looking for a dose of the good life. The city's success as a banging tourist hotspot is the result of its foolproof formula: abundant wealth + VIP treatment. But don't be fooled, there's more to Dubai than its excesses. Here, tradition contrasts with modernisation, as both thrive in unison. Take a ride in one of the water taxis called dhows alongside the glistening yachts on the Dubai Creek; shop for bling at the age-old gold souks which lie in the shadow of gleaming skyscrapers; and go dune bashing on the outskirts of the bustling city, where you fly over the sand dunes and leave the fast-paced city behind. You can easily manage most of this over a 48-hour trip, eager to leave Indian shores behind for a blink. Check into One & Only at The Palm for the weekend and enjoy an action packed itinerary. Take a ride up to the top of the Burj Khalifa, the tallest building in the world which gives you a bird's eye view of Dubai from the observation deck on the 124th floor. Next, ditch the string of malls for something a tad different. Although it is attached to a mall, Sauce is a quirky boutique that attained the status of a fashion retail phenomenon in the city, where it's known for its trendsetting fashion & lifestyle concept. After all, Dubai is synonymous with shopping. Dubai feeds the shopaholic in you and the foodie too. Spend the weekend high on an excess of food and drink. The China Moon champagne bar is housed within the glass apex of the new Raffles Hotel, and is one of the hottest bars in town. With a very memorable 360-degrees-view, you don't want to miss a Saturday night drink-up here. Also at the Raffles, proceed to have dinner at the Fire & Ice restaurant, where you're served dishes that look and taste superlative. Food and drink aside, a weekend is all about pampering yourself before the gruelling week ahead. We recommend a session at the Intercontinental hotel spa where you're treated like royalty. Forty eight hours in Dubai may not be time enough to unwind, but honestly, who goes there for that? Head here for a quickie that leaves you wired and raring to go. If you have time enough for a quick escape and love the high life we highly recommend Kuala Lumpur. What was once a tin-mining shanty town has transformed into a metropolis of bright lights and soaring skyscrapers. Known for little aside from its shopping bargains, KL is in fact a melting pot of culture and cuisine scattered across its three districts: Little India, Chinatown, and the historic quarter. With fantastic hotels ranging from global chains to characteristic boutiques, limit your choice down to the Mandarin Oriental at the city centre and the luxury boutique hotel, the Ritz-Carlton. 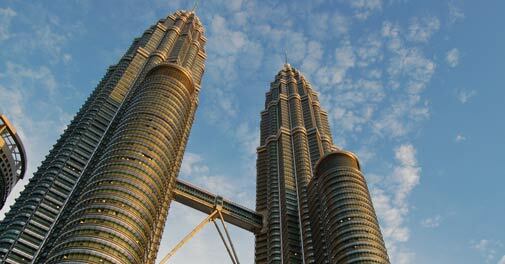 Throw in some quick sightseeing if it's a first visit, including a trip to Petronas Twin Towers. At a height of 451.9 meters, visitors can go up to the 41st floor Skybridge for an undiluted view of the city. Another must-see is the Islamic Arts Museum. Built on 30,000 square metres, it is the largest of its kind in Southeast Asia, housing over 7,000 artefacts ranging from intricate jewellery to large-scale models of Islamic mosques. For food reflective of the local flavour, Old China Cafe serves Nonya cuisine unique to Malaysia. And while you're there, pop upstairs to the antique gallery where you can sift through the bric-a-brac for a souvenir to bring home. However, the best cuisine is arguably found at the street kitchens known as hawker centers - overeat your way through the menu at Cu Cha, known for its flat rice noodles fried with clams and shrimp. For something more upmarket, the SkyBar lounge on the 33rd floor of Traders Hotel is perfect for a cocktail. Spare an evening for jazz at the No Black Tie. Conceived as an answer to stuffy classical-music halls, this club has morphed into one of the city's coolest night spots with its uber quirky vibe. Wind up in the wee hours at Changkat Bukit Bintang. Dotted on either side by velvet-roped dance clubs and bars, a nightcap here is a must before you turn in. Truly a weekend city, get ready to hit the dance floor by night and pack in some wicked shopping during the day. There are a million ways to describe Bangkok. The city is a razzmatazz of odd smells, unusual food, unconventional sport, quaint culture and infinite shopping. A weekend here has all the elements that will fit into a Hangover kind of film sequel, so it is truly the perfect escape for testosterone-toting young men looking to party. When you're deciding where to stay, make sure you settle on something on the riverside if you're not looking for a wild weekend. One of Bangkok's most prestigious areas, this is where you'll find the finest hotels including the Mandarin Oriental, Peninsula, and Lebua, which with its sky bar remains a hot favourite with visitors of all ages A word of caution: avoid taking to the streets, and opt for a ferry or Skytrain; those horrific tales you've heard about the traffic are all true. Start you day of sightseeing with the Jim Thompson House. This artfully designed complex lies enclosed within a garden compound on the bank of the Saen Saeb Canal, and was once the home of an American architect who became an intelligence officer until he mysteriously disappeared. A museum filled with an incongruous collection of antiques, it's a must-visit. Next, take a ride on one of the long-tail boats navigating along the Chao Phraya river, where you wind your way through the city's traditional stilt houses and floating markets to absorb the city's rhythm. To stir things up, catch a muay thai (kick boxing) match. The national sport of Thailand, no trip here is complete till you've witnessed the national champs beat each other up. 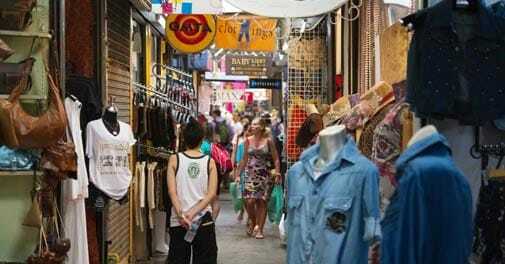 If you've heard about the Chatuchak Weekend Market, it's with good reason. The sheer size and volume of merchandise makes it worth a visit. The phrase 'shop till you drop' probably originated here. Aside from obvious shopping hubs like Central World and Siam Paragon, check out the Siam Discovery Center, where you can pick up unique stuff by local designers. The best food in Bangkok is served off innocuous street carts that are cheap, hygienic and highly original. If your feet are tired and you'd rather splurge at a restaurant, try Blue Elephant, where the menu is divided into traditional and modern Thai cuisine to give you the best of both. Higher upscale, the afternoon tea at the Mandarin Oriental Authors' Lounge is an experience with its delicious savouries, fine jazz and elegant atmosphere. But as the sun sets, move up to the Vertigo Grill and Moon Bar for a drink. Perched 61 stories above the city, it gives you a dazzling view of everything below. Bangkok is favoured by Indians as a weekend destination because the flight is quick and you can have yourself a great 48 hours without emptying your wallet. 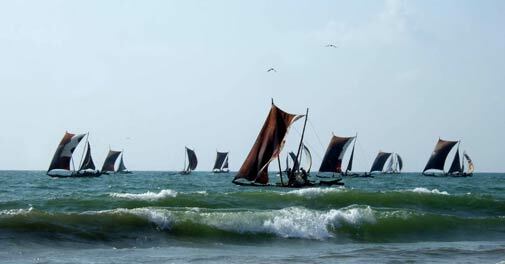 After years of unrest, peace was declared on the tear shaped island of Srilanka in 2009, restoring equilibrium to what was once referred to by Arab traders as Serendib, or serendipity. A weekend on the Island's seaside capital of Colombo makes for the perfect getaway - a tropical cocktail of beauty, culture and vibrancy steeped in 2,500 years of history. Colombo has a lot to offer: serene golden beaches, Buddhist temples, adventure sports, vibrant nightlife, shopping, herbal treatments and delicious cuisine; name it, and you've got it. The Tintagel Hotel at the heart of Colombo's most elite neighbourhood, Rosemead Place is one of the best places you can book at. Home to the former president of Sri Lanka, it is tangible proof of the country's history with its high ceilings and timber floors bearing testimony to traditional Sri Lankan architecture. Though Colombo works better as a leisurely holiday for beach bums, there are a few things you can pack into your weekend. For starters, pay a visit to Barefoot; tripling as a gallery, cafe, and store all at once, this one-stop shop is an efficient way to mix shopping and browsing with a taste of the famous Ceylon tea from the cafe. But if that's not your cup of tea, you could go for a round of golf at The Royal Colombo course or then head to Odel to shop for designer-wear and lifestyle products which won't burn a hole in your pocket. Though Colombo has its share of upscale shopping malls, your pennies would be better spent at Pettah. Selling everything under the sun, from clothes and accessories, to jewellery, cosmetics and even household items off street stalls, it's a staple with the locals. Needless to say, retail therapy always leaves you hungry. Wind up your shopping spree at the trendy Gallery Cafe. A chic restaurant located in the former offices of renowned Sri Lankan architect Geoffrey Bawa, this is the place to see and been seen in Colombo. The menu is an interesting fusion of French, Italian, Spanish, Thai and Sri Lankan influences, and the desserts served here are some of Colombo's best. Another meal should be reserved for Nihonbashi, a Japanese restaurant where the miso soup, beef Sukiyaki and wasabi ice cream are an absolute must. As night falls, there's a vibrant list of venues open all night long. Club Mojo at the Taj Samudra is where the party's at. With a unique circular dance floor, roving laser lighting system and thumping beats, it offers a constant inflow of live acts and DJs.